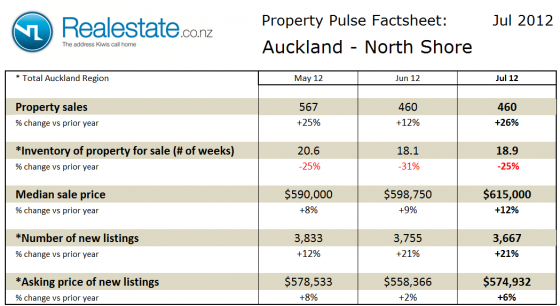 The June 2013 NZ Property Report published by Realestate.co.nz provides an insight into the state of the New Zealand property market as measured by the supply side of the property market over the month of June. The key measures of the market analysed in the report are the number of new listings, the asking price expectation for those new listings and the level of inventory of unsold houses on the market at this time. The report is compiled from data captured by the website and represents close to 97% of all property movements in the NZ market as managed by licensed real estate agents. A full print version of the NZ Property Report – June 2013 is published below and is available for download (1.2MB) and distribution. 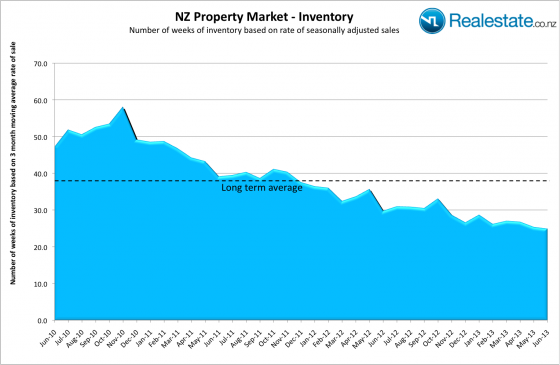 The inventory of unsold properties in New Zealand has fallen to the lowest point in six years, reporting just 24.9 weeks nationwide. The record shortage was driven by low inventory in all major regions, with Canterbury, Waikato and Central Otago all witnessing new all-time lows. Wellington also fell to just 15.4 weeks, the lowest since November 2009, while Auckland recovered slightly from last month’s record low to 12.3 weeks, but still sits 58% below its long term average of 29 weeks. 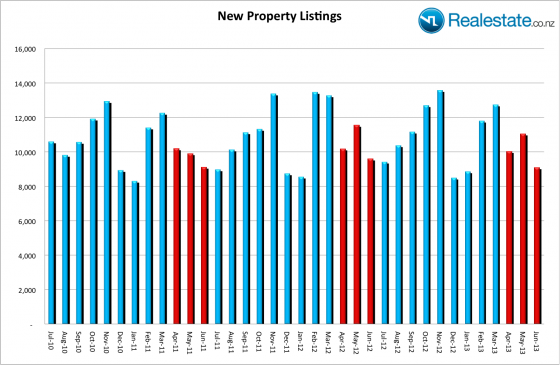 The number of new listings coming to the market in June was down 5% on the same time last year to the lowest June listings in 7 years. The figure of 9,082 follows strong listing numbers in April and May. Asking prices eased slightly in June, to $450,178 (down just 1% from the record high figure seen in May). In the main centres, both Wellington and Canterbury asking prices rose 1% to $451,622 (Wellington), and 410,723 (Canterbury). 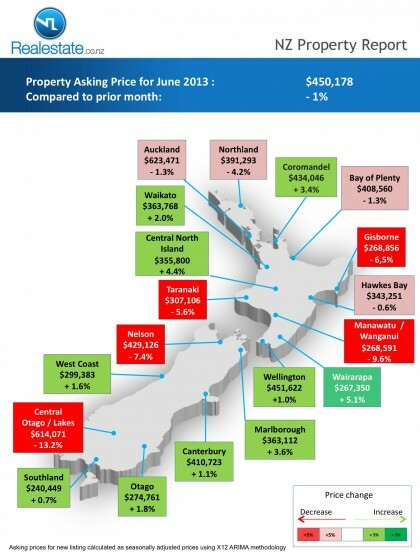 The asking price in Auckland witnessed a slight fall in June (down 1.3% to $623,471). All three regions sit close to their respective asking price peaks. The seasonally adjusted truncated mean asking price for listings fell slightly in June to $450,178, down 1% on the record set in May. This represented a year on year increase of 5.7%. 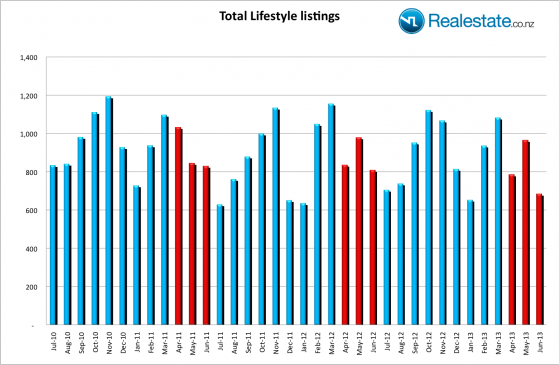 The level of new listings coming onto the market in June fell back to 9,082 from 11,045 in May. This represents a fall of 18%, and was the lowest number of June listings for 7 years, demonstrating that the sellers are still apprehensive of listing their properties despite the record low inventory. On a 12 month moving average basis a total of 130,547 new listings have come to the market since July 2012, as compared to 130,188 in the prior 12 month period, a rise of just 0.3%. This compares to REINZ reported sales, which are up 16% on a 12 month comparable basis. The level of unsold houses on the market at the end of June (37,615) was down 5%, when compared to May (39,698). Inventory, as measured in terms of equivalent weeks of sales fell in June to a record low of 24.9 weeks, remaining well below the long-term average of 38 weeks. The market remains firmly a seller’s market; with 14 of the 19 regions showing inventory levels that are well below long term averages. Canterbury, Waikato, and Central Lakes continue to witness the highest extent of this, reaching record low inventory in June. The national asking price expectation among sellers fell by just 1% in June, from the record high set in May, to an asking price of $450,178. (seasonally adjusted truncated mean). In the main centres, both Wellington and Canterbury asking prices rose 1% to $451,622 (Wellington), and 410,723 (Canterbury). The asking price in Auckland witnessed a slight fall in September (down 1.3% to $623,471). All three regions sit close to their respective asking price peaks. In total 10 regions reported asking price increases, and just 1 region saw a rise of greater than 5%. The most significant rise was seen in the Wairarapa, up 5.1% to $267,350. Of the 9 regions witnessing asking price falls on a seasonally adjusted basis there were 5 that reported a fall greater than 5%. The most significant falls were seen in Gisborne, Taranaki, Nelson, Manawatu / Wanganui and Central Otago / Lakes regions, with Central Otago / Lakes showing the largest fall, down 13% to $614,071. The picture for new listings across the country continues to show that there is a reluctance to bring new properties to the market. There were 14 of the 19 regions that reported new listings down on the prior year, with just 1 of these reporting a fall of over 20%. The most significant drop in listings was seen in West Coast, which fell by 26.5%. Of the 5 regions that reported higher new listings than June last year, Nelson was the region to report the highest increase, up 15.4% when compared to June 2012, followed by Northland which saw an increase of 7.6%. 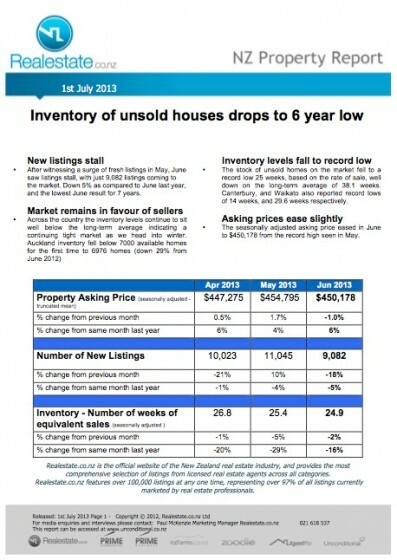 The inventory of unsold homes on the market tightened to a all time low of 25 weeks of equivilent sales in June. Market sentiment continues to favour sellers in 15 regions, with the greatest strain being felt in the 11 regions that are marked in darker blue. This includes the main metro areas of Auckland, Canterbury, and Wellington, which all remain under pressure from low listings as measured against sales activity. Just one region (Southland) showed an increase in inventory of homes on the market taking it above their respective long-term average. In addition 3 regions (Central North Island, Marlborough, and Taranaki) sit close to their long term averages. 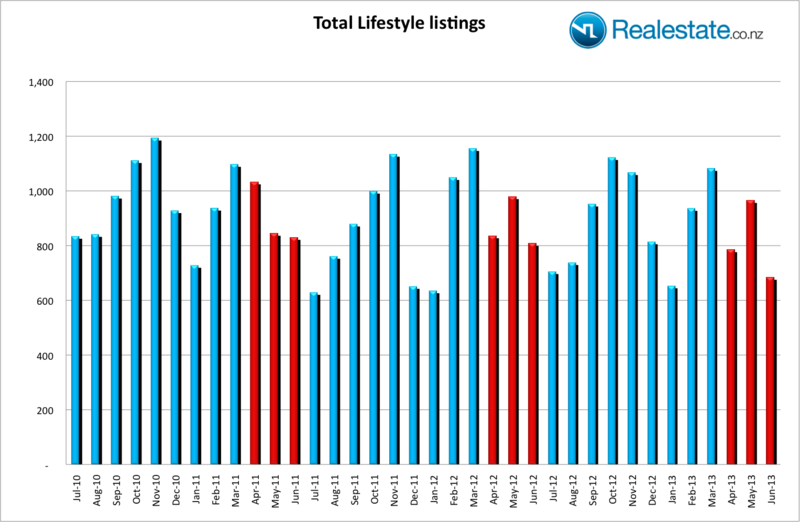 New lifestyle property listings fell across the country in June. A total of just 683 listings came onto the market, showing a fall of 29% when compared to May, and a fall of 15.4% when compared to June last year. Canterbury saw record low numbers of new lifestyle listings with just 62 coming to the market. The national truncated mean asking price of $645,204 for these listings, was down by 2.6% as compared to the recent 3-month average (but up 1.8% when compared to June 2012). New listings for apartments in June were down 1.3% on a year on year basis, and down 19.5% from May, with 450 being brought to the market. The truncated mean asking price of new apartment listings fell 2.5% to $374,374 in June from $383,953 in May, and was down 1.9% on a year on year basis. 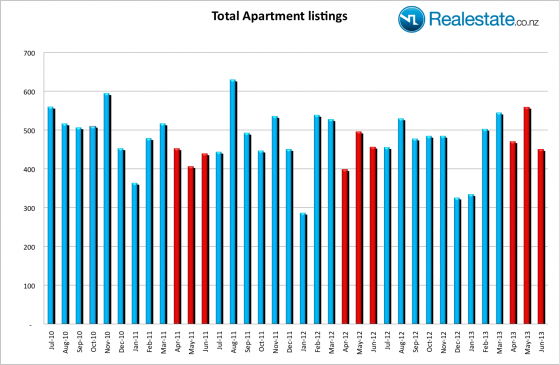 The Auckland apartment market had 316 new listings, up 9% when compared to June last year. 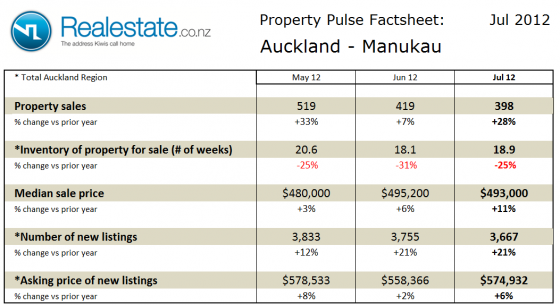 The truncated mean asking price of new listings in Auckland fell to $354,882, down from $348,476 in May. When compared to the recent 3-month average, this represents a fall of 3.2%. Truncated mean The monthly asking price for new listings presented in this report utilises the measure of ‘truncated mean’. This measure is judged to be a more accurate measure of the market price than average price as it statistically removes the extremes that exist within any property market that can so easily introduce a skew to traditional average price figures. The truncated mean used in this report removes the upper 10% and the lower 10% of listings in each data set. 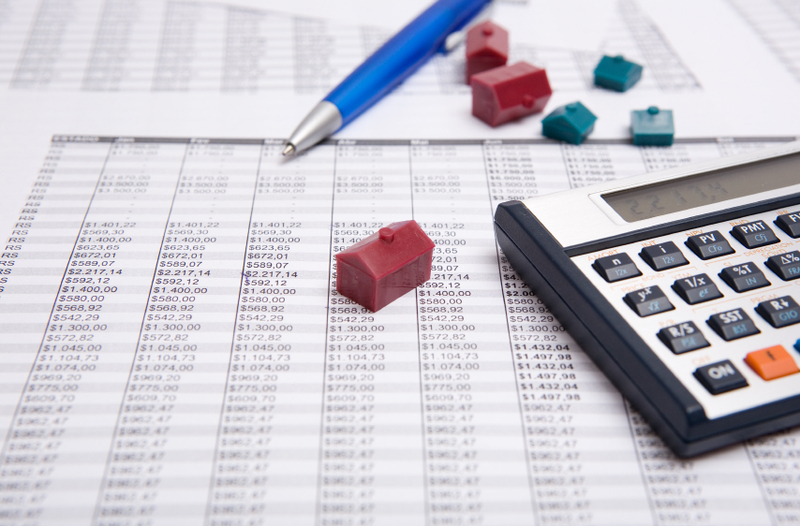 An average or mean of the balance of listings is then calculated. Methodology With the largest database of properties for sale in NZ from licensed real estate agents, realestate.co.nz is uniquely placed to immediately identify any changes in the marketplace. The realestate.co.nz NZ Property Report is compiled from new listings coming onto the market from the more than 1,000 licensed real estate offices across NZ, representing more than 97% of all offices. With an average monthly level of over 10,000 new listings, the realestate.co.nz NZ Property Report provides the largest monthly sample report on the residential property market, as well as a more timely view of the property market than any other property report. The data is collated and analysed at the close of each month, and the Report is compiled for the 1st day of the following month. This provides a feedback mechanism as to the immediate state of the market, well in advance of sales statistics, which by the very nature of the selling process can reflect activity with a lag of between 2 and 4 months. Seasonally adjustment The core data for the NZ Property Report is seasonally adjusted to better represent the core underlying trend of the property market in NZ. In preparing this seasonally adjusted data Realestate.co.nz is grateful for the assistance of the New Zealand Institute of Economic Research (NZIER) who use an X12 ARIMA methodology to calculate seasonally adjusted data. Realestate.co.nz is the heart of the business and is focused to the residential property market. It features the most comprehensive selection of property for sale and rent across NZ. The website attracts a significant monthly audience of over 500,000 unique browsers, with over 120,000 of those visiting from countries outside of NZ. In addition Realestate.co.nz receives over 30% of all traffic to property listings from mobile devices, including their iPhone and Android applications. To date these applications have been downloaded by over 160,000 users making the app the most popular property app in NZ. nzFarms is a specialist website presenting the most comprehensive selection of farms and agricultural businesses on the market across NZ. At this time it features around 3,000 listings for all types of farms and agricultural land as well as over 10,000 lifestyle properties. Prime Commercial is a specialist website presenting the most comprehensive selection of commercial property for purchase or lease on the market across NZ. At this time it features over 25,000 listings for all types of properties – retail, commercial, industrial and investment properties. Prime Business is a specialist website presenting the most comprehensive selection of businesses for sale on the market across NZ. At this time it features over 3,500 listings for all types of businesses – retail, tourism, wholesale as well as franchise opportunities. The web business of Realestate.co.nz site is the most comprehensive real estate web operation in NZ, currently hosting over 110,000 listings, covering this portfolio of residential property for sale and rent, commercial property for sale and lease, rural properties and farms, as well as businesses for sale. With a subscriber base of over 1,000 offices, the company represents over 97% of all listings from licensed real estate agents in NZ. 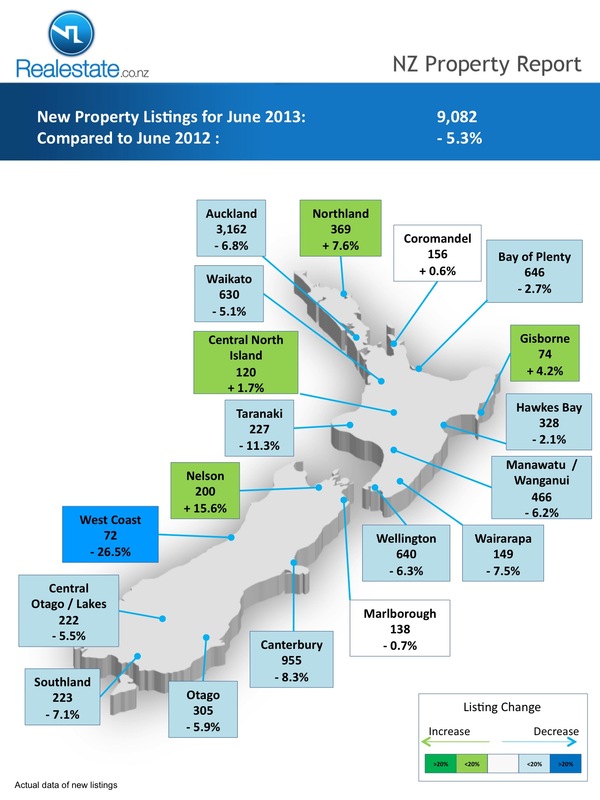 The full NZ Property Report for June 2013 can be downloaded here (1.2MB pdf document). Additionally the raw data is accessible here as an Excel spreadsheet enabling anyone to analyse the raw data and establish any trends or observations. Usage rights are governed under attribution to the source of the data being Realestate.co.nz. 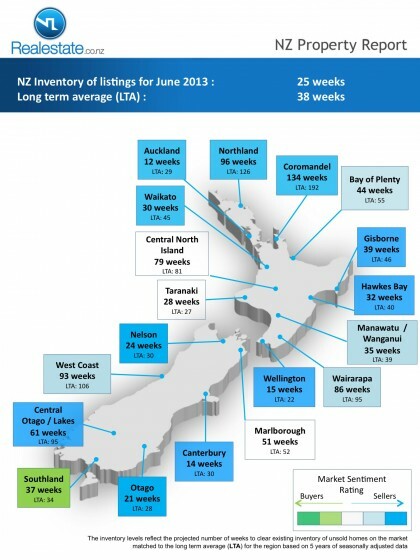 The next NZ Property Report for July 2013 will be published on this website on 1st August 2013 at 10am. 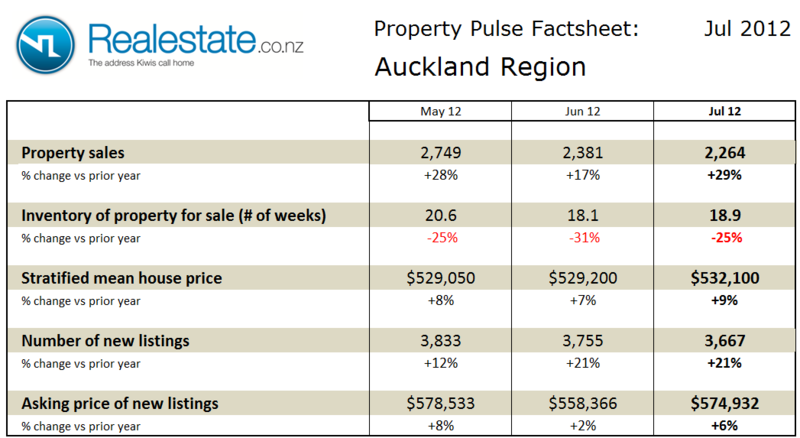 The Auckland region property pulse factsheet for July 2012 is published using data from Realestate.co.nz and REINZ (Real Estate Institute of NZ). 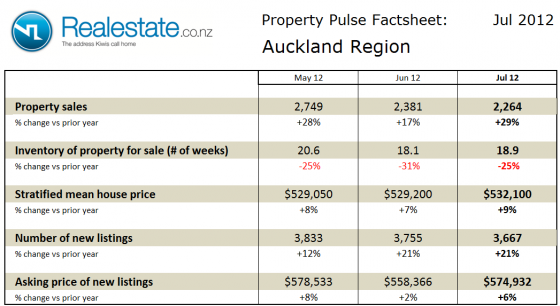 Property sales across the Auckland region totaled 2,264 in the month showing a rise on a seasonally adjusted basis. As compared to July last year sales are up a very strong 29%. The inventory of unsold houses across region at 18.9 weeks remains firmly well below the long-term average of 32 weeks of equivalent sales. The stratified median house price at $532,100 rose 9% as compared to a year ago to reach a new high. 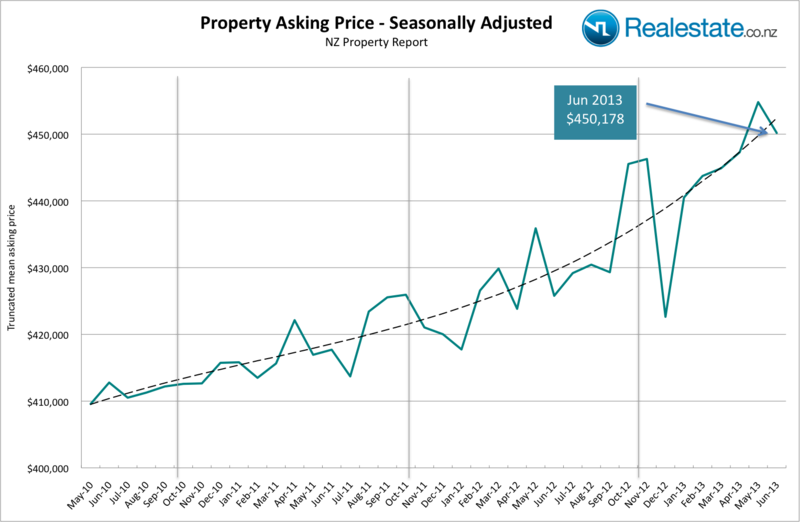 Prices started to rise across the region in the beginning of 2011 where the price in January 2011 was $464,425 and have risen steadily since then to the new level of $532,100 a rise of 14%. The asking price expectation of new listings equally rose to $574,932 edging close the record level set in May and showing a year-on-year growth of 6%. The level of new listings coming onto the market across the wider Auckland region in July at 3,667 were up 21% as compared to a year ago. The data indicates that across the Auckland region the property market continues to show strong growth, demand for property is strong which has been the case for over the past 9 months, this matched to low inventory and strong selling price appreciation places the market firmly to the advantage of sellers who are able to influence the market direction through supply management. The Auckland North Shore property pulse factsheet for July 2012 is published using data from Realestate.co.nz and REINZ (Real Estate Institute of NZ). Property sales on the North Shore of Auckland totaled 460 in July identical to June, which on a seasonally adjusted basis showed a strong rise. As compared to July 2011 sales were up 26%. The inventory of unsold houses across the wider Auckland region at 18.9 weeks remains firmly well below the long-term average of 32 weeks of equivalent sales. The median sales price for properties sold on the North Shore in July at $615,000 was up 12% from a year ago. The asking price expectation of new listings across the wider Auckland region rose in the month and recorded a 6% rise as compared to July last year to $574,932. The data indicates that the North Shore of Auckland continues to show strong growth in the market, demand for property is strong which has been the case for over the past 9 months, this matched to low inventory and strong selling price appreciation places the market firmly to the advantage of sellers who are able to influence the market direction through supply management. 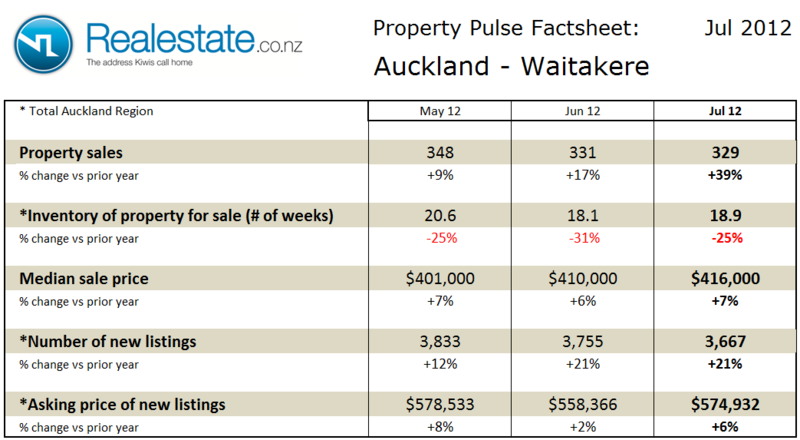 The Auckland – Waitakere property pulse factsheet for July 2012 is published using data from Realestate.co.nz and REINZ (Real Estate Institute of NZ). 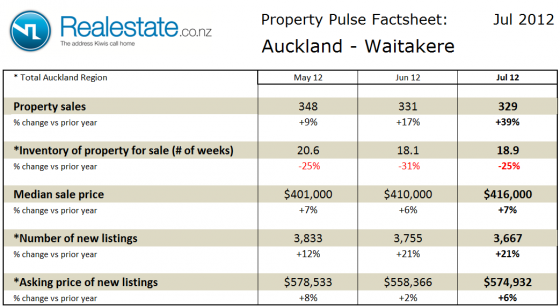 Property sales in the Waitakere area of Auckland totaled at 329 in the month only just less than the total in June. On a seasonally adjusted basis sales were up on June and up a very significant 39% on July 2011. The inventory of unsold houses across the wider Auckland region at 18.9 weeks remains firmly well below the long-term average of 32 weeks of equivalent sales. The median sales price for property in the Waitakere region of Auckland at $416,000 is up 7% as compared to a year ago. The asking price expectation of new listings across the wider Auckland region rose in the month and recorded a 6% rise as compared to July last year to $574,932. The data indicates that the Waitakere region of Auckland continues to show strong demand which has been the case for over 18 months and especially in the past 7 months; this matched to low inventory and strong selling price appreciation places the market firmly to the advantage of sellers who are able to influence the market direction through supply management. The Auckland City property pulse factsheet for July 2012 is published using data from Realestate.co.nz and REINZ (Real Estate Institute of NZ). Property sales within the City of Auckland totaled 741 in the month. This showed a fall on a seasonally adjusted basis in July but was up 22% on July 2011. The inventory of unsold houses across the wider Auckland region at 18.9 weeks remains firmly well below the long-term average of 32 weeks of equivalent sales. The median sales price for property in Auckland City at $566,000 was up 9% as compared to July last year and up from the June level of $556,000. The asking price expectation of new listings across the wider Auckland region rose in the month and recorded a 6% rise as compared to July last year to $574,932. The data indicates that the Auckland Central continues to show very strong demand which has been the case for over 18 months, this matched to low inventory and strong selling price appreciation places the market firmly to the advantage of sellers who are able to influence the market direction through supply management. 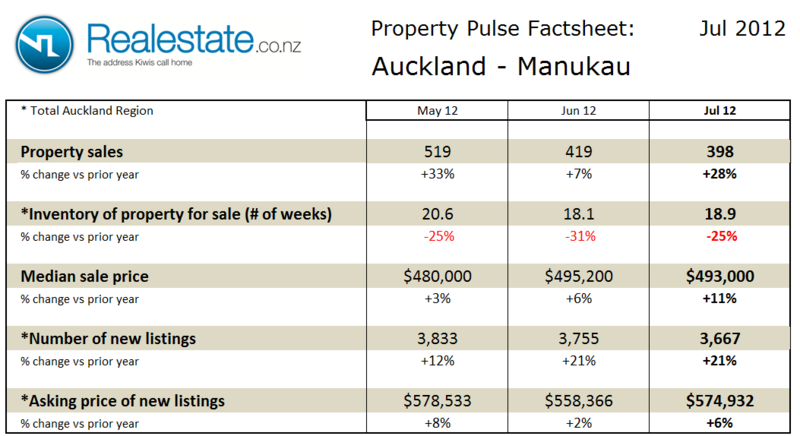 The Auckland – Manukau property pulse factsheet for July 2012 is published using data from Realestate.co.nz and REINZ (Real Estate Institute of NZ). Property sales in the Manukau region of Auckland totaled 398 in the month, up slightly on a seasonally adjusted basis and up a significant 28% as compared to July last year. The inventory of unsold houses across the wider Auckland region at 18.9 weeks remains firmly well below the long-term average of 32 weeks of equivalent sales. The median sales at $493,00 was up 11% as compared to July last year and held up well as compared to June which recorded a sale price of $495,200. The asking price expectation of new listings across the wider Auckland region rose in the month and recorded a 6% rise as compared to July last year to $574,932. The data indicates that the Manukau region continues to show strong demand which has been the case for over 18 months, this matched to low inventory and strong selling price appreciation places the market firmly to the advantage of sellers who are able to influence the market direction through supply management. 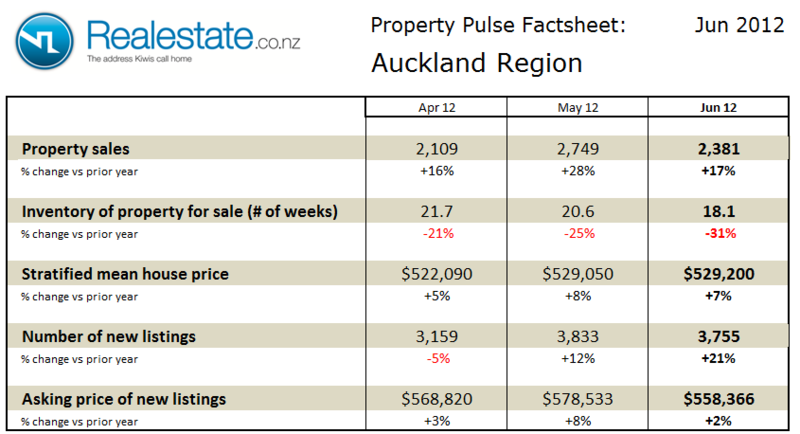 The Auckland region property pulse factsheet for June 2012 is published using data from Realestate.co.nz and REINZ (Real Estate Institute of NZ). 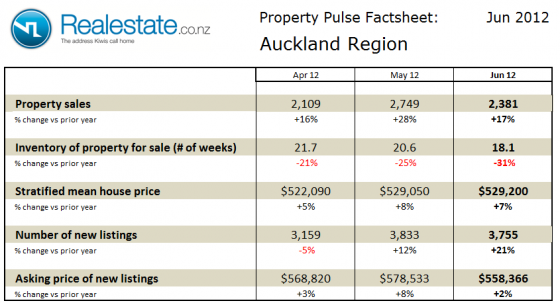 Property sales across the Auckland region at 2,381 in the month fell slightly on a seasonally adjusted basis in June but was up 17% on June 2011. The inventory of unsold houses slipped lower again to below 20 weeks to sit at 18.1 weeks, the lowest recorded level for over 4 years, this level of inventory continues to track well below the long-term average of 33 weeks of equivalent sales. The stratified median house price at $529,200 rose 7% as compared to a year ago and continues to show a strong growth now over the past 18 months. The asking price expectation of new listings fell though to $558,366 up 2% as compared to a year ago. The level of new listings coming onto the market across the Auckland region in June at 3,755 was up 21% as compared to a year ago, however this increase has not dented the low level of inventory of houses on the market. 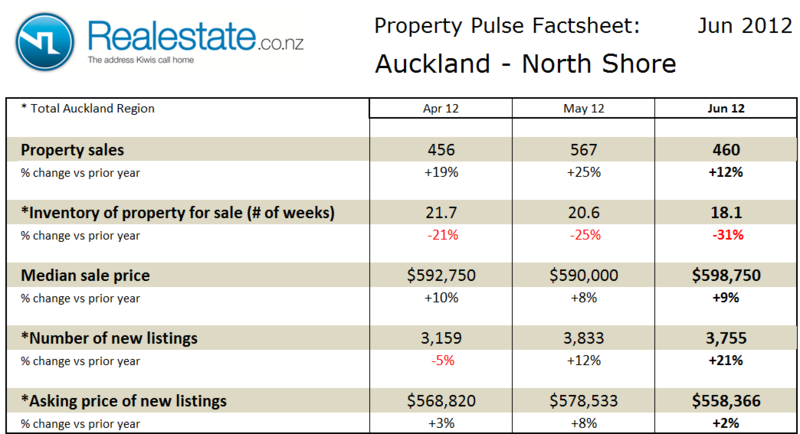 The Auckland North Shore property pulse factsheet for June 2012 is published using data from Realestate.co.nz and REINZ (Real Estate Institute of NZ). 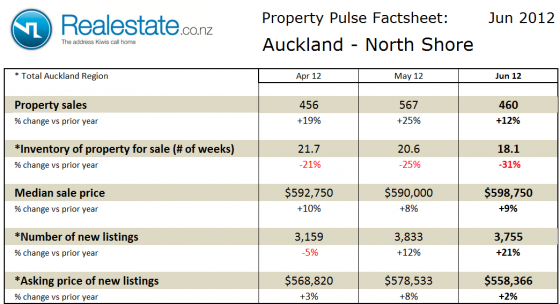 Property sales on the North Shore of Auckland at 460 in the month fell on a seasonally adjusted basis in June but was up 12% on June 2011. The inventory of unsold houses across the wider Auckland region at 18.1 weeks remains below the long-term average at 33 weeks of equivalent sales. The median sales price for properties sold on the North Shore in June at $598,750 was up 9% from a year ago. The asking price expectation of new listings across the wider Auckland region fell as compared to May to $558,366 but was up 2% as compared to a year ago. The level of new listings coming onto the market across the wider Auckland region in June at 3,755 was up 21% as compared to a year ago. 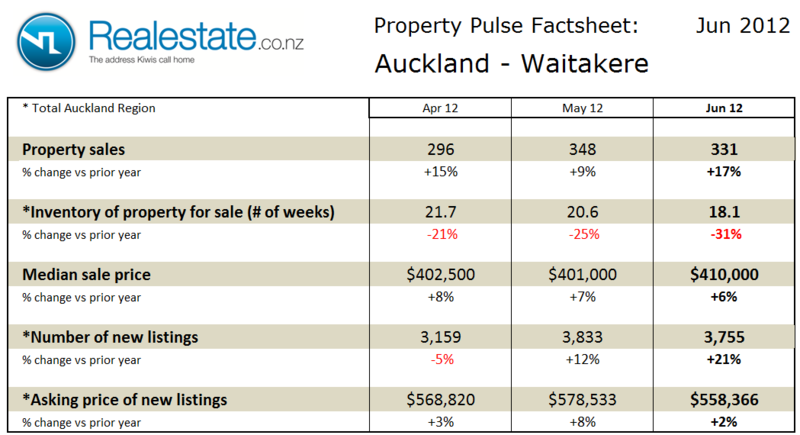 The Auckland – Waitakere property pulse factsheet for June 2012 is published using data from Realestate.co.nz and REINZ (Real Estate Institute of NZ). 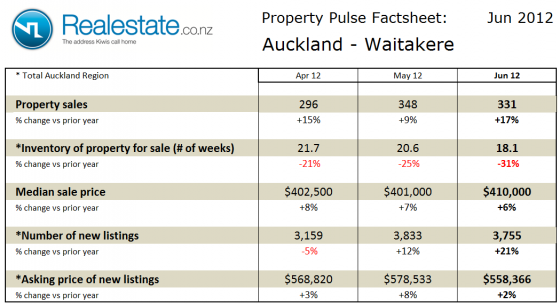 Property sales in the Waitakere are of Auckland at 331very slightly in the month rose on a seasonally adjusted basis and was up 17% on June 2011. The inventory of unsold houses across the wider Auckland region at 18.1 weeks remains below the long-term average at 33 weeks of equivalent sales. The median sales price for property in the Waitakere region of Auckland at $410,000 is up 6% as compared to a year ago. The asking price expectation of new listings across the wider Auckland region fell as compared to May to $558,366 but was up 2% as compared to a year ago. 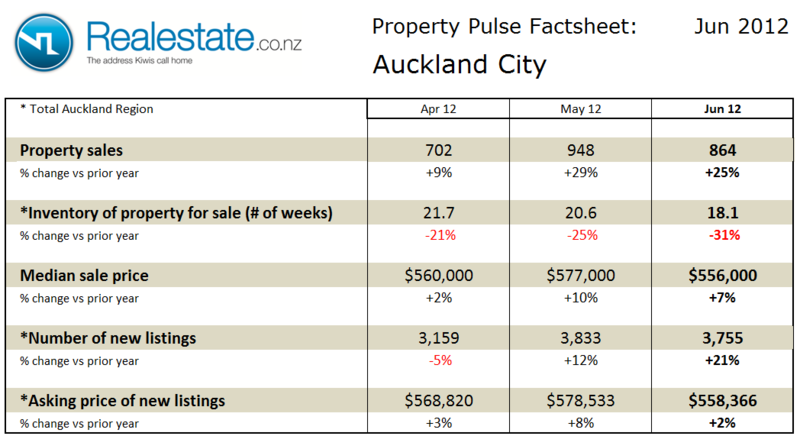 The Auckland City property pulse factsheet for June 2012 is published using data from Realestate.co.nz and REINZ (Real Estate Institute of NZ). Property sales within the City of Auckland at 864 in the month rose on a seasonally adjusted basis in June and was up 25% on June 2011. The inventory of unsold houses across the wider Auckland region at 18.1 weeks remains below the long-term average at 33 weeks of equivalent sales. The median sales price for property in Auckland City at $556,000 was up 7% although it did slip from the record high reported in May. The asking price expectation of new listings across the wider Auckland region fell as compared to May to $558,366 but was up 2% as compared to a year ago.